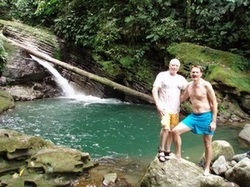 Barrio Bird Walking Tours offers unique travel services for gay and lesbian tourists visiting San Jose, Costa Rica. Our Yigüirro Concierge's Service is the one-stop shop for answering questions as simple as what hotels are gay friendly to the more intimate......where can I meet same interested Ticos/Ticas? Our aim is to provide you with trustworthy information in a private space, where all of your questions can be addressed. Typical questions often concern which places can I meet other gay/lesbian people and which areas are the best to vacation and socialize, as well as events to match your travel dates. Using the service is easy. Simply purchase the concierge service from our menu, and email your questions to BarrioBird@gmail.com. When we have receipt of your purchase we'll respond to your questions within 24 hours. In San Jose, gays and lesbians can travel comfortably compared to other parts of Central America. And, there are a number of venues continually hosting gay/lesbian events. If you want to explore more than the two or three clubs mentioned in your travel guides, however, hire one of our guides to take you out for a night on the town and show you the listed and unlisted San Jose treasures you don't want to miss. Pricing is determined based on your requests. Email BarrioBird@gmail.com or call 6050 - 1952 to book your guide. The Yigüirro is the national bird of Costa Rica. 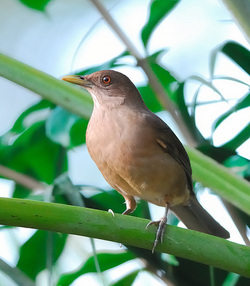 It is best known for its song delivered right before a rainstorm (of which there are many in the rainy season). It was also slang some time ago for 'gays' in Costa Rica. Even though it was often used as a slur, we want to turn the negative into a positive and rescue the values of this beautiful songbird by including it proudly in our family of Barrio Bird services. Our travel agency partner Gecko Trail Costa Rica offers complete packages to visit Costa Rica including gay friendly or gay exclusive accommodations, transport and tours. We highly recommend their Bi-Coastal package which includes San Jose (a Barrio Bird tour of course!) and both the Pacific and Caribbean Coasts. You can see all the specialized services they offer to gay and lesbian clients at their website.